The Dust Bowl Life is reflected in the lyrics of a song that was sung in the Shafter Farm Security Administration (FSA) migrant worker camp. The lyrics of the song called "I'd Rather Not Be on Relief" are from a poem by Lester Hunter, that was written in 1938. The words conveys Dust Bowl Life and the views of the people who were suffering during the Great Depression and whose lives had been devastated by the drought and the dust storms that had created the 1930's Dust Bowl in the prairie states of America. 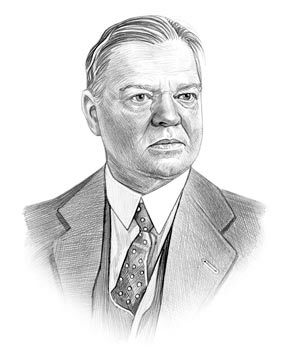 Herbert Hoover was the 31st American President who served in office from March 4, 1929 to March 4, 1933. One of the important events during his presidency was the Dust Bowl Disaster. Dust Bowl Life: "I'd Rather Not Be on Relief"
The words of "I'd Rather Not Be on Relief" by Lester Hunter was written in 1938 in the midst of the Dust Bowl Disaster. The humiliating aspects of Dust Bowl Life is reflected in the lyrics of the song and the views of the people that were experiencing the problems of the Dust Bowl disaster. Lester Hunter was a migrant from the Dust Bowl who was forced to move from his home and travel to California in a desperate search for a new life, a new home and a new job. Lester Hunter, like so many other Dust Bowl migrants, did not want charity, they wanted to work - hence the title "I'd Rather Not Be on Relief". The poem was turned into a song by Dust Bowl migrants at the Shafter FSA Camp in California in 1938. The Dust Bowl was a disaster of epic proportions. It began with a drought in 1930 and the soil in the prairie states turned to dust. Crops were literally blew away in "black blizzards". The dust storms destroyed 100 million acres of land in the 'Dust Bowl' and resulted in 3 million farmers becoming unemployed, losing their homes and forced to start a new, uncertain life in unaffected states such as California and Florida. It is estimated that 200,000 migrants from the prairies states headed for California. Lester Hunter was just one of those migrants. Lester Hunter expresses his views of the welfare and relief programs initiated by President Franklin D. Roosevelt in his 'New Deal' in his poem. Roosevelt's 'New Deal instituted the 3 R's - Relief, Recovery and Reform. Lester Hunter believed that the government's welfare programs were simply short term solutions to long term problems. The lyrics to "I'd Rather Not Be on Relief" by Lester Hunter is an excellent primary source document that can be used by teachers and student studying the history of Dust Bowl life using words of a man who experienced the ordeal first-hand, and his views of Dust Bowl life. Just right click on the picture to print a copy of the lyrics. You will be surprised at the real meanings behind the lyrics of this seemingly amusing and inoffensive song. Dust Bowl life is reflected in Verse 1 by just one word - "rags". This simple word conveys the destitution and plight of the migrants. The word "rags" conveys dire poverty, and the threadbare and tattered clothes worn by paupers. Lester Hunter contrasts the migrants predicament of being reduced to wearing rags as "the rest of the world goes neat". The type of housing the migrants are reduced to living in are described as 'lean-tos' and 'tents' and he makes it clear that migrants, such as himself, are going hungry. His overriding issue of not wanting to be on relief extends to working on the WPA. The WPA was the Works Progress Administration, a government program introduced in 1935 that paid people to work on government public works construction projects. Lester Hunter was a farmer, not a construction worker and believed the labor resource provided by the migrant farmers would help the Californian farmers to become more prosperous. And again, the proud man made reference to his clothes "wearing patches". Verse 3 conveys the numbers of the migrants who arrived in California "swarm of bees" and the reaction of Californians to the migrants. The lyrics state that "The migratory workers are worse of than a bum". Established citizens in California, frightened by the arrival of so many migrants attempted to prevent their entry into the state, establishing a border patrol, dubbed the "Bum Blockade," at major rail and road crossings. Traditionally cheap, temporary Mexican labor had been used by the farmers in California. It is clear in the reference to "gypsy workers" that the Dust Bowl migrants, like Mexican workers, were treated like second class citizens. In Verse 4, Lester Hunter makes it clear that he is not asking for "luxuries". A reference to the rapid rise of consumerism in the 1920s. He talks of being "bound to raise the dickens". No, it isn't a typing error for 'chickens'. The word "bound" meaning being obliged, determined or resolved combined with the use of the idiom "raise the dickens" meaning protesting in an angry and forceful manner. He is worried about the coming winter months when agricultural work completely runs out and how he will feed his family. The last verse reflects Lester Hunter's view of the future. The slang phrase "Chuck a crack" means making a mighty attempt to make things better before the winter sets in. He's decided that the way to do this is to join the "C.I.O.". The CIO stands for the Congress of Industrial Workers, a labor union, which was founded in 1935. The CIO split from the AFL American Federation of Labor (AFL). The CIO was much more aggressive in organizing unskilled workers, who had not been represented before, and increasing their bargaining power with employers. The article on the Dust Bowl Life provides detailed facts and a summary of one of the important events during his presidential term in office. The following Herbert Hoover video will give you additional important facts and dates about the political events experienced by the 31st American President whose presidency spanned from March 4, 1929 to March 4, 1933.